As reported earlier, The Iconfactory's Craig Hockenberry recently posted an open letter to Steve Jobs excoriating the proliferation of what he called “ringtone apps”—essentially, 99-cent applications available for purchase and download from the App Store. Hockenberry notes—as a lot of App Store developers have, almost since the day the App Store opened—that developers feel pressured to lower the prices on their products in order to secure favorable placement on the App Store’s Top Paid Apps lists. Hockenberry goes on to explain The Iconfactory’s business model, and paints in broad strokes the development costs of the kind of apps that his company has made, such as the wonderfully addictive iPhone game Frenzic and the Twitter client Twitterific. The development cost of applications like this, he says, preclude the ability to sell them for 99 cents. And that puts such programs at a disadvantage with what Hockenberry calls “crapware” priced less than these products. Hockenberry may be correct when he suggests in his letter to Steve Jobs that it’s incumbent upon Apple to make the App Store a better place to shop, but I think he’s missing the bigger picture. As I said in June, developers who want to get ahead on the App Store can’t take the approach used by Ray Kinsella, Kevin Costner’s character in the movie “Field of Dreams”: Build it and they will come. Developers need to be much smarter than that. Neil Young, the CEO of iPhone game maker Ngmoco, recently described the App Store as “like going to Wal-Mart or Best Buy without any racks or meaningful merchandising—like being handed a list when you walk in the front door and seeing a big pile of software.” I think he’s absolutely dead on. I was astonished at the Worldwide Developers Conference in June when I’d ask iPhone developers about their marketing strategy for iPhone apps. And they’d respond to me with blank stares, or tell me that they were expecting “viral marketing” to work for them—to wit, getting people to talk up their products. “The issue is then getting people to see that our $2.99 product really is worth three times the price of a 99-cent piece of crapware,” Hockenberry writes in his letter. And he's right that this is the issue. 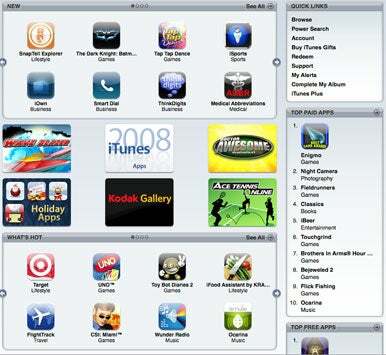 How do you break through the clutter of the App Store? That’s the responsibility of software developers to figure out. But it’s not Apple’s to sort out. It’s yours. Ngmoco’s Young has the right idea: Companies carving out a place for themselves in the App Store ecosystem need to leverage PR and marketing resources. They need to make that part of their strategy to win the hearts and minds of customers. They need to convince people that it’s worth the money to spend on their applications. They need to buy ads and develop a brand identity and establish some sense of continuity for their customers. “I see customers complaining about how ‘expensive’ a $4.99 app is and that it should cost less. (Do they do the same thing when they walk into Starbucks? )” Hockenberry adds in his letter. Of course they do—I hear people complaining about the price of a Starbucks venti skinny vanilla latte constantly. Usually it’s when they’re in line to buy one, or waiting for the barista to heat up their non-fat milk, but they buy them anyway because they’ve established a connection to the company. They know what they’re going to get because Starbucks has successfully marketed its products to them. Ralph Waldo Emerson was dead wrong when he said that if you build a better mousetrap, the world will beat a path to your door. Building a better mousetrap is the first step, but you also have to develop a better marketing and business plan than the competitors if you want to win. Almost 25 years after the debut of the Macintosh, everyone in the Apple ecosystem should be keenly aware of this. The Mac was then, and is now, a far better personal computing experience than the alternative. But that didn’t stop Windows from usurping the Mac as the dominant personal computer operating system. I’m dead certain that one person is more aware of this than anyone else: The guy who Craig Hockenberry wrote his letter to in the first place, Steve Jobs.